High Mass~ Four months earlier Delila, a young gothic beauty finds herself attending a midnight mass at St. Patrick’s Cathedral in NYC. The ceremony is interrupted by a psychopathic character who physically and verbally attacks and denigrates the very acts and ideas of religious ceremony and rite. Identifying himself as Lucian, he proclaims the advent of a new way replacing the old. Blink 69~ The next day finds friends Delila and Lisa on a train heading upstate to attend a football game. Missing the previous night’s drama, Lisa plies Delila with questions about Lucian. Lisa and Lucian have established a puzzling yet smoldering romance based primarily on the club action of Foreverlightless and Lucian’s poetry. Lucian is on the same train. As a walk-on player he has wowed everyone, including pro scouts with his on-field feats that seem super-human. Strawberry Blink~ Lisa confronts Lucian on the train trying to figure out where things stand with their relationship. Lucian hints at things to come and offers a token of his intentions albeit still vague and poetic. Pearl Blink~ Lisa and Delila ponder and discuss Lucian’s gift. The jewelry he’s given Lisa not only accelerates and elevates the relationship, it grants exclusive access and privilege to the extreme side of Foreverlightless which is where Lucian thrives. Lisa ponders an earlier encounter with Lucian with her father that still haunts her. Choices need to be made and it seems Lucian’s spell is drawing Lisa deeper into whatever it is he is involved with. Lisa is still unsure of just what it is but relishes the goth club scene and the obvious physical attraction she has for Lucian. Hail Mary, Blink Right~ It’s game time and everyone’s there except Lucian. Accosted and beaten savagely by members of the rival football team who have gotten word of Lucian’s antics at the cathedral and his goth ways, Lucian is bound and imprisoned. Miraculously, Lucian appears late in the game, unscathed and ready to wreak havoc on the field. It’s the Lucian Show. It appears that Lucian’s actions, especially these last 2 days have been carefully scripted and planned to propagate and establish his legacy. He has become the poster-boy/ambassador for Foreverlightless. Within the course of a few football plays, Lucian single-handedly destroys the rival team/captors, and seemingly wins the game. The superhuman physicality that Lucian displays, witnessed by Lisa and others more than hints at his involvement with some extraordinary power or process. Lloyd’s Surprise~ A pre-arranged romantic rendezvous following Lucian’s epic display leaves Lisa shaken after she experiences a dark, sinister presence she can’t explain. A Rose is a Rose is a Rose~ While making his way with Lisa to catch the train home Lucian again demonstrates his intentions with a reference to an Oscar Wilde poem that will become central to Lucian’s theology. Comical, extreme irony abounds as they race to catch their ride home. Lucian makes one last grand display as he leaves Lisa when she is unable to totally commit to his offer. Before leaving for the Pacific Northwest where our story began, Lucian leaves a cryptic note that only later Lisa understands. Dr. Pascal, a world-renowned psychologist/criminal profiler finds himself returning to the castle of an illusionist that he has been obsessed with for years. He would trade all he has to uncover the secret behind the grand illusion Elymas has been astounding the world with for years. Finding himself the primary participant in Elymas’ grand finale, Pascal is convinced to take Elymas as a patient to try and uncover and analyze the dark premonitions of blood and death plaguing the magician. What will comes from this twisted alliance? Are these premonitions linked to reality? What’s with the pearls and hummingbirds? Preflight~ July 18, 2014 Nine months have passed since Lucian left Lisa at Bannerman’s Castle. Lisa has spent that time enjoying the exclusive access to Foreverlightless that Lucian had bestowed on her. The combination of virtual reality and bloodmagicstir potions has Lisa addicted to the darker side of the dance club that few know about. Sporadic and limited contact with Lucian through virtual reality leaves Lisa clueless about their relationship but club life more than offsets any negatives. Lucian finally contacts Lisa this night and they share a passionate virtual reality experience culminating in an invitation for Lisa and her friends to join him in the Pacific Northwest. Night Flight~ July 19 The very next night finds Lisa and her friends in Coeur d’Alene, Idaho at Lazzaretto House, an extension of Foreverlightless that has a heritage steeped in gothic history. Lucian swoops in for Lisa and they fly off to his “castle” on Lake Pend Oreille 30 minutes north. Lucian exerts more pressure on Lisa to join him in his quest that is finally taking shape in Lisa’s mind. Later in the story exactly what lays behind the stone cliffs is discovered. This discovery by an unlikely source will only add fuel to the approaching firestorm that will engulf our characters in a couple of days. L&L Fly~ July 21 Whatever took place at Lucian’s castle has led to this special night that Lucian has dreamed of… a consummation, a wedding of sorts. The glamour and technology of Foreverlightless is now forefront and becoming more apparent to Lisa as Lucian pledges his life to her atop NYC. Probing the limits of romance, Lucian pushes the limits of sacrifice and commitment as their free-flight through the city ends in a gripping watery finale that will turn this story on its head. Is Lucian, the dark poet a narcissistic raving lunatic with delusions of grandeur? Have the experiments, training and genetic manipulation broken Lucian? Find out why the first chapter of this story is written in a different font. What of Lisa? Is there a malignant evil behind the secret doors of Foreverlightless? What is this power seeking to consume all who succumb to this gothic psycho-sensual lure? NSTAV~ July 22 It now appears that a serial killer is to blame for three deaths within the last 2 weeks. Detective Willard wasn’t sure until now. This latest body in Central park confirms it. 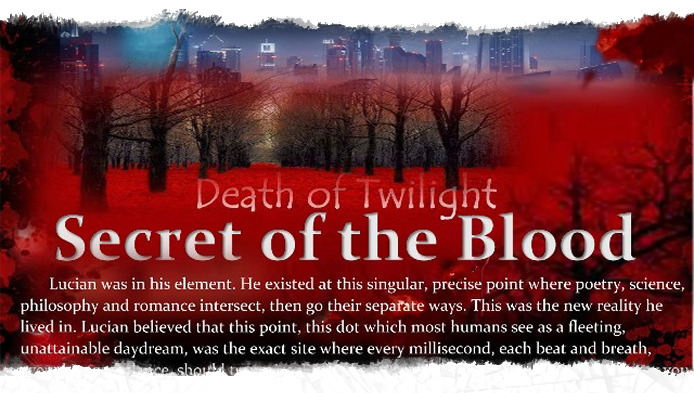 There seems a connection to Foreverlightless that prompts the news media to label these murders “Death of Twilight” killings due to the vampiric nature of Foreverlightless and the goth lifestyle of the victims. Near the breaking point due to the recent death of his wife, Willard struggles to maintain his sanity. A mysterious phone call interrupts his investigation in Central Park and he finds himself alone with another body and the possible killer in the Tattooed Forest of Foreverlightless. It appears the victim Willard finds is ___. Whiskey and Waffles~ July 22-23, Tues/Wed Overwhelmed by the presence and specter of death, Willard seeks to diminish his responsibilities in the case by convincing his superior to call in an expert in this field. Recruiting this experts’ assistance is anything but routine considering the history shared with Willard. This bizarre reunion of ex-partners is accented by an unnerving discovery as Willard knocks on Van Bibber’s front door. When chilling details beyond the realm of coincidence are laid out stark and bare by Willard, VB, who is battling personal problems of his own joins the investigation. Haunted by reminders of the serial killer case that nearly cost him his life, VB struggles to rebuild his life with Kelly his wife and Johnny Walker Red, no ice. Things currently aren’t going so well. Denied access to Foreverlightless, VB goes native and infiltrates the scene, embarking on a midnight foray deep into the far reaches of the Foreverlightless compound. The Tattooed Forest~ VB penetrates the outer defenses of the Foreverlightless grounds and finds himself surround by the carvings on the trees in the Tattooed Forest. Cryptic poems and messages hundreds of years old with famous and anonymous signatures to be believed or not stare VB in the face. The legacy of Foreverlightless, just as rumors belied, run deep and strong with strong hints of vampirism and cultic practice. Carvings by Lisa and Lucian along with those from the very hand of Oscar Wilde particularly catch VB’s eye along with other names that will surely figure in the grand scheme of the case. VB is interrupted by what appears to be a crime in progress only to discover that he is witnessing a sensual, ritualistic game of hide and seek. VB finds the spot where Willard discovered the body and makes the biggest discovery in the case so far. Dark Wishing Well~ VB comes upon a sort of vampire funeral at the site of what turns out to be a technological marvel. VB confronts the mysterious character Stonelight who immediately inserts himself into the muddled mix of players in the case. A puzzling brief encounter with Lucian only adds to VB’s confusion as he attempts to sort through the facts and clues. Foreverlightless Harbor~ Witnessing a seaside séance, VB now knows that this case is unlike any other he has ever been involved with. He questions a frightened, delusional Delila who hints at a force responsible for the deaths of her friends. All the secrets and clues seem to lie deep behind the doors of Foreverlightless. Returning empty-handed to his motel VB ruminates on the case and his life in general. An early morning call from Willard has him on a direct flight when more bodies are discovered in The Pacific Northwest.